Grandpa will be Hooked on his new Fishing Personalized T-Shirts from the Grandkids. He will proudly display all of their names while fishing with his buddies. Our Fishing Personalized Shirt is available on our premium white 100% cotton Personalized T-Shirt, machine washable in adult sizes S-3XL. Includes FREE Personalization! 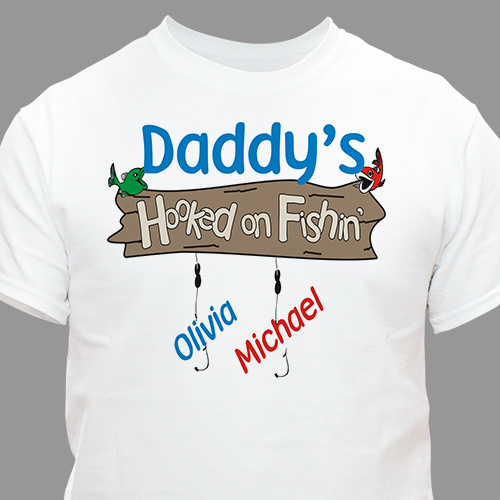 Personalize your Hooked on Fishing T-Shirt with any title and up to 30 names. My Dad loved getting this shirt. There was enough room for all 12 grandkids. Awesome gift! So cute!!! :) We bought it for Papa for Father's day and I know he will love it! The colors are bright and fun. Great quality too!! Be sure to look at our entire collection of Personalized Fishing And Hunting Gifts for Him. These Personalized Fishing & Hunting Gifts are perfect gift selections for Birthdays, Anniversaries & the Christmas season.